Most of us don’t think of travel as a political act. And sadly, those that do — at least from what I’ve observed traveling — seem to think that means taking your politics with you on the road. If ever there was something you should absolutely leave at home… But travel can be a politically broadening act, that is, travel can be a way to get you outside your well-formed opinions and the comfort zone that created them. That idea has lately found an unlikely spokesperson — guidebook guru, Rick Steves. I know what you’re thinking, you mean the guy that wrote those books your parents take to Europe in the summer? Yeah that one. And the books are pretty good by the way. 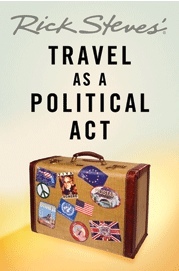 Steves’ has a very fascinating new book out, Travel as a Political Act , that is not only very different from the Rick Steves you see on your local PBS channel, but downright incendiary for a travel writer of Steves’ stature. In Travel as a Political Act , Steves urges travelers to get out of their comfort zones and let the world you’re exploring shape you, rather than forcing it to simply conform to your expectations. In the course of the book (which I should note, I haven’t finished yet), Steves’ recounts his own travels to controversial places like El Salvador and more recently, Iran, and how those experiences have changed him. It’s more fun to travel as a cultural chameleon—embracing cultural norms of the places you’re visiting, not judging but trying to understand. I used to think poorly of Hindus for taking better care of their cows than their children. Then I went to India. I used to not care about why my bananas were so cheap. Then I went to Nicaragua. I thought fast service was good service. Then I went to France. But more than encouraging others to head to “dangerous” places (most of which aren’t really), what Steves is interested in is getting travelers (the real and armchair variety) to drop their preconceived ideas. It sounds like a pretty obvious idea, but you’d be surprised how many travelers are shocked to learn that the world does not share a homogenized dream or even a similar way of looking at life. “I used to think poorly of Hindus for taking better care of their cows than their children. ” what a really inane thing to say. What evidence is there ? Indian cows are often in poor shape and they provide milk for the children. So true about leaving pre-conceptions at home. I’ve gotten into it a little on another blog in which some well-meaning American Peace Corps volunteers are very upset about how animals, particularly dogs, are treated in Mongolia. What I think they are seeing is a culture that doesn’t sentimentalize animals and does, by our standards, mistreat them at times, mostly by not actively caring for them. But they are young and judgemental and very willing to make assumptions about motives and causes on very little experience. They assume that what they see in another country means the same thing as it would if they saw it here, which is by no means true. So, three cheers for Rick Steves!